April is one of those tricky months where you never know what kind of weather you’re going to get; it could be spring, it could be winter or it could be a bit of both. 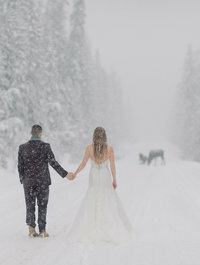 This year the mountains have seen quite a bit of late season snow, so I wasn’t surprised to find the snow falling pretty intently when I met up with Melissa & Jason at the Juniper Hotel in Banff for their elopement ceremony. They got married on the terrace at the Juniper Hotel, which, on a clear day, has beautiful mountain views, however with all the snow the mountains were totally obscured but the falling snow against the dark trees does make for a pretty background. After the wedding ceremony we wandered off to Vermilion Lakes and Lake Minnewanka for a few more portraits and in search of a mountain background somehow. The winds were pretty intense on Vermilion Lakes so we didn’t last there for too long! We managed to get a hint of mountains in the background at Lake Minnewanka through all the snow for their Banff elopement photography before ending photos for the day. Melissa & Jason returned to the Juniper where they had a celebratory dinner at the bistro and I hit the road to head home, enjoying the drive in the snow. 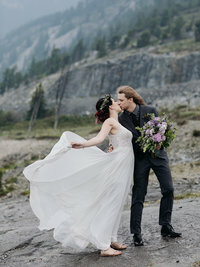 These are some of my favourite photos from Melissa & Jason’s Banff elopement! Are you planning to elope? 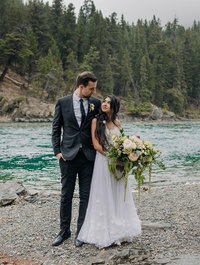 Are you looking for Banff Elopement Photography? ENV Photography would love to be the one to capture your mountain destination wedding! 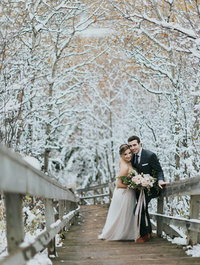 Please get in touch for more information on weddings & engagement sessions in Banff, Lake Louise and other destinations. If you aren’t in the market for a Banff Engagement photographer or a Banff Wedding Photographer, ENV Photography also photographs maternity, kids & families!